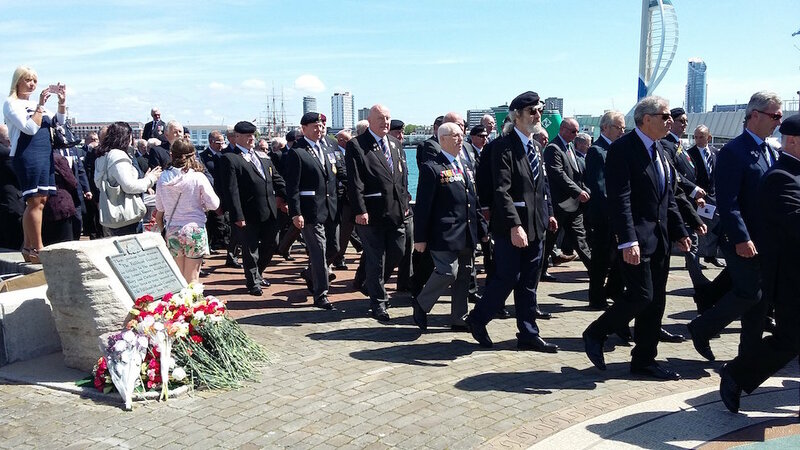 Veterans from the British Armed Forces who fought in the Falklands campaign in 1982 paraded in Gosport on 21 May in a moving ceremony to commemorate the 35th anniversary of the Falklands conflict in 1982. It was good to see the strong public support and spontaneous applause as the veterans processed along Gosport High Street. British people are proud of what they achieved – the return of liberty to the Falkland Islanders and the freedom to determine their own future. 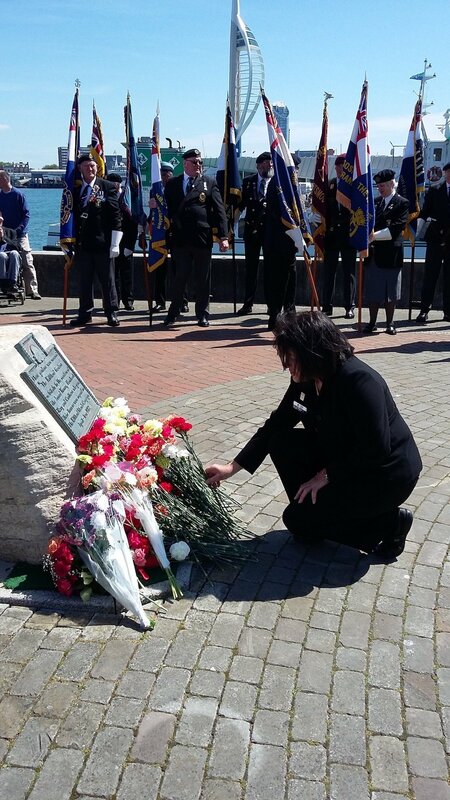 Veterans of the Falklands conflict in 1982 gathered at the Falklands Memorial Gardens in Gosport on Portsmouth Harbour on Sunday, 21 May ’17 to commemorate the 35th anniversary of the Falklands war. 21 May is the date of the landing of the main British armed forces in San Carlos to begin the long slog to Stanley (and the surrender of Argentine forces on 14 June ‘82). The parade, organised by the Falklands Veterans Foundation (FVF), as led by a Royal Marines band, followed by veterans, both those still serving and retirees. 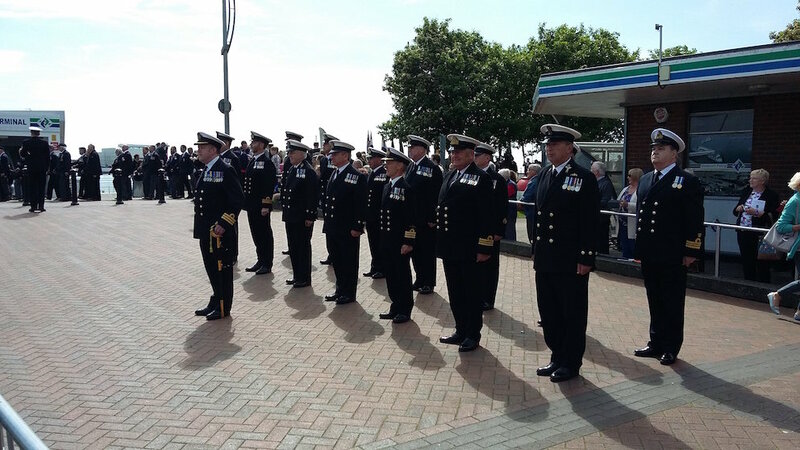 The salute was taken by two senior veterans – the still serving Admiral Sir Philip Jones KCB, ADC, First Sea Lord and Chief of Naval Staff, and Rear Admiral Iain Henderson CB, CBE, DL who served on HMS Plymouth during the Falklands conflict. The service was conducted by the Rev’d Brian Williams and attended by the Mayor of Gosport, Cllr. Linda Batty. It ended with a roll call of the fallen, each name being read out by a student of St Vincent College, Gosport. As the names were read out, a flower was placed by the memorial plaque. FIA Executive Committee member, Deborah Northwood, laid one on behalf of the Falkland Islands Association (FIA). Participants then processed along Gosport High Street to Walpole Park where refreshments were served. The sun was shining and the veterans had a very special day, thanks to Gosport Borough Council and the Falklands Veterans Foundation. Note: Gosport on Portsmouth Harbour was heavily involved in the organisation and despatch of the fleet of the British Task Force, sent by Prime Minister Margaret Thatcher to liberate the Falkland Islands from illegal Argentine military occupation in April 1982. 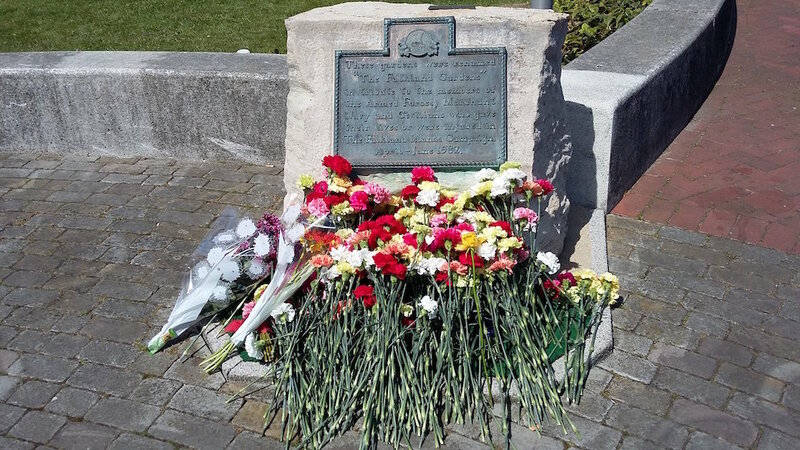 Gosport has supported the Falklands veterans by holding a commemorative service in the specially created Garden of Remembrance every five years since the 15th anniversary in 1997. The Falklands Veterans Foundation (FVF) was founded in 2002 (the year of the 20th anniversary of the conflict). It was the first charity to be set up with the specific aim of assisting veterans of the Falklands conflict - and it established Liberty Lodge in Stanley as a place where Falklands veterans visiting the Islands could stay. In 2005, the FVF was awarded the Freedom of the Borough of Gosport. It organises the attendance of Falklands veterans at these Gosport ceremonies.